Having been involved in the streetrod and collector car hobby for over 40 years, Jim & Carol Stauner realized that there wasn't anyplace to purchase the unique, high quality custom components they wanted for their projects. So with a background in fabrication, they designed and built their own. While attending events around the country, they were constantly being asked where some of these components could be purchased. 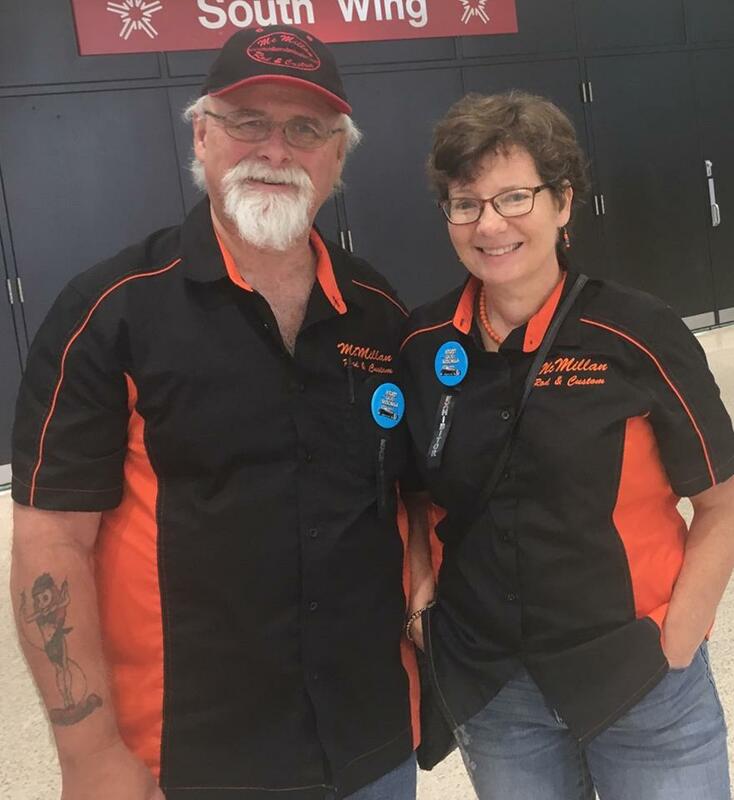 After testing the market for several years at swap meets and car shows, they decided to offer a line of custom built, stainless steel products. They emphasize high quality at a reasonable cost and will custom build each piece to the customer's exact specifications. 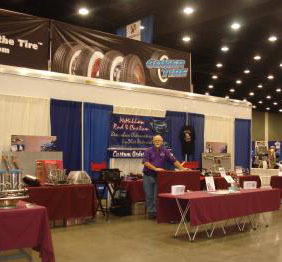 Jim is a typical lifelong car guy, started out with muscle cars and drag racing. Met Carol and took her to a drag race (first date) and been together ever since. Proud to say he still owns the car he drove (and raced) in high school, then made the transition into street rods when the family arrived. He worked at a large stainless steel fabrication shop (learned the trade from "the old timers") as a fabricator/welder for 23 years. Then Jim went on to a smaller shop as a supervisor/trainer for another ten years. 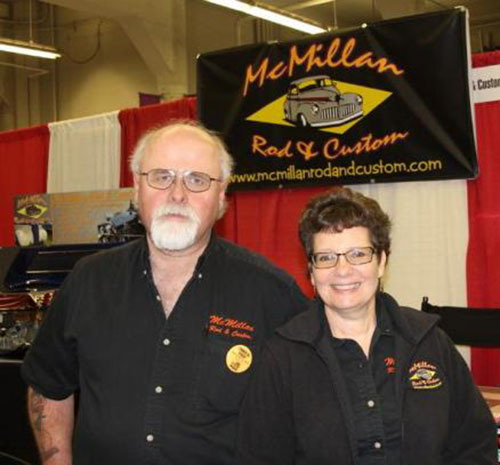 Jim and Carol started McMillan Rod & Custom part-time back in the mid 90's building a few pieces for friends and it grew into a full time occupation in 2010. He has owned numerous collector cars and street rods and always seems to have at least one project in the works. Jim was involved in the NSRA Safety Inspection Program as a volunteer inspector for 15 years. He has been active in a local car club, North Central Classics & Customs and has served as president twice, secretary, and newsletter editor. Hobbies include driving his street rod, hunting/shooting and cooking. Favorite part of being in this business is the people you get to meet and help. You just can't beat streetrodders. Least favorite part is the traveling to the events in the shop truck pulling the trailer, not the events. Once he is there, he is fine, but the actual drive time drives him nuts. Growing up on the family farm in rural Wisconsin, Carol always thought she would stay in the farming business. That was until she met Jim on a snowy night when her car became stuck and Jim came to her rescue. After a couple of months she agreed to go on a date with him (to a drag race of all places!) Carol had never been to one before, much less, rode in a drag car. Well, she enjoyed the race and the company and "as they say" the rest is history. Carol is truly a street rodder at heart. She owns her own streetrod, a 1948 Studebaker truck which she has driven herself to many events around the Midwest. In the past when Jim was on the NSRA safety team, Carol had helped. She is active in the local car club where she has served as president, secretary and newsletter editor. She is hard working, loves interacting with people, and genuinely cares about everyone she meets. Carol is active in church and community and works full time with Jim doing the shop bookkeeping, marketing, taking orders, shipping, quality control, traveling to trade shows and any other loose ends that need attention. She loves the outdoors, gardening, biking and spoiling grandsons. Together they are married over 35 years and are parents of three adult children with five grandsons. They both share the passion for supplying customers with the highest quality products available in the industry. with your ideas and we will be happy to give you a free quote on the cost. 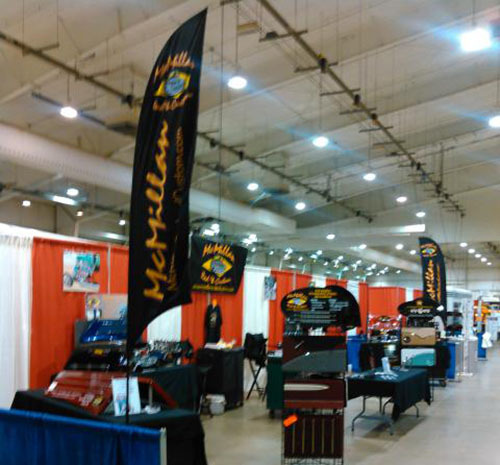 We have setup at the NSRA Streetrod Nationals event in Louisville, Kentucky since 2007 and will continue in the future in spots numbers 508 and 509. We have setup at Back to the 50's event at St. Paul, MN in the Grandstand building from 2005 and will continue in the future. Please check out the Events page to find us at a show near you!